Most building materials which we use for constructing walls are porous, in simple terms this means they will (or have the ability to) absorb water if they come into in contact with it. This is because the materials are not solid, but contain many very small holes called pores and capillaries into which water can pass. As water spreads through porous materials it draws more water along behind it – even against the force of gravity – in much the same way that a kitchen towel will absorb a small spill of water if just one edge of it is dipped into the water. This basically means that a wall in contact with wet ground will absorb water and the water will eventually pass up the walls – this is rising damp. Rising dampness is the result of capillarity, this being the process in which water rises up the very fine tubes formed by the pores. As the water passes up the wall, it evaporates away from the surface at a rate mainly depending on the temperature and type of wall covering. Eventually the amount of water passing into the wall is balanced by the amount which can evaporate and the water does not reach any higher up the wall. This may result in a tide mark being seen across the wall – below it the wall is constantly damp, but above it is relatively dry. The height of the tide mark depends on the dampness of the ground and how quickly water can evaporate from the wall. If the wall is coated with a water resistant covering, such as tiles, gloss paint or vinyl paper, the damp may reach much higher before it can evaporate. Rising damp rarely rises above a height of 1 metre above the external ground level and / or the internal solid floor level. 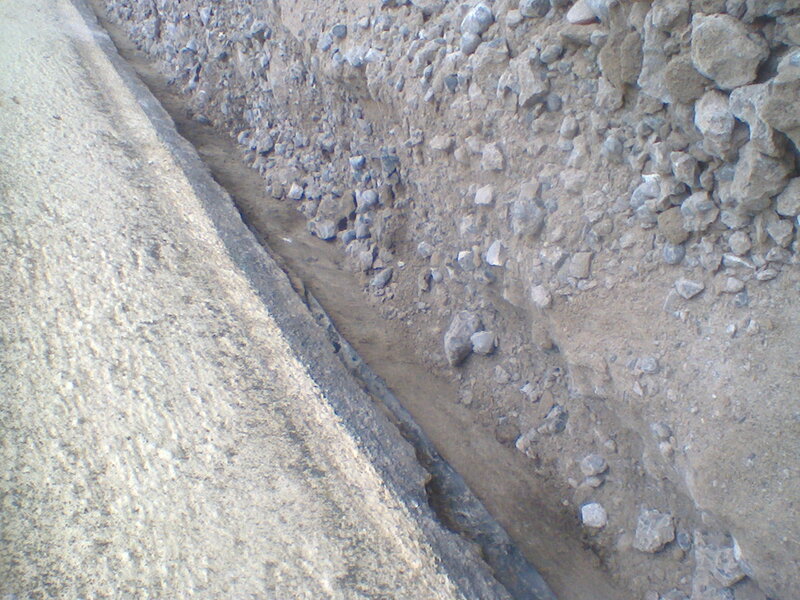 Often the rising water will carry salts into the wall from the ground. These can react with plaster or brickwork and a deposit of crumbly white crystals may be seen on the surface. They can be brushed off, and may build up again, and affected plaster will eventually perish, becoming soft and falling off. 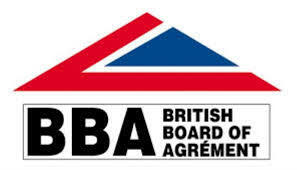 The installation of either a chemical or electrosmotic damp-proof course (dpc) is only one part of the treatment. 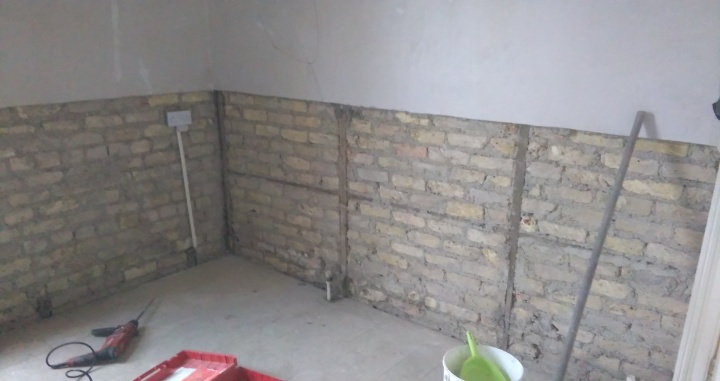 Even when a new damp proof course has been installed and the rising damp problem is under control, the affected wall is still going to contain residual dampness within it, as well as hygroscopic salts carried up from the ground. These will continue to attack plaster and decorations. 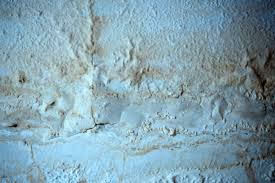 Plaster contaminated by visible dampness and / or Hygroscopic salt contamination must be removed (usually at least 1m high) and be replaced as well. This is well documented in British Standard 6576:2005. 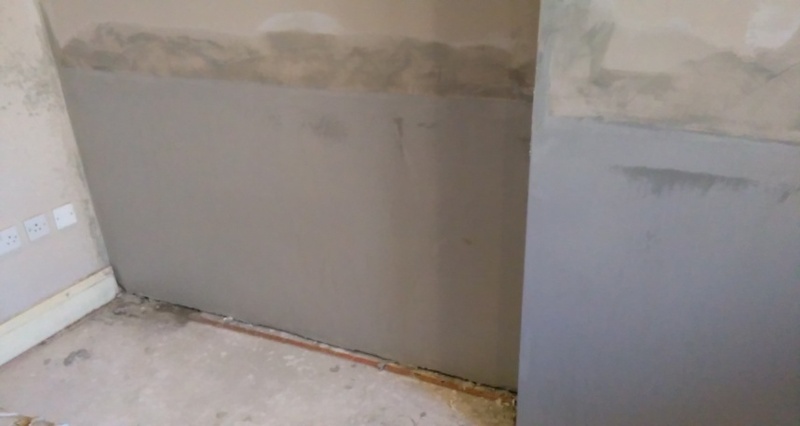 Both the installation of the dpc and the associated replastering when carried out by ourselves form part of the damproofing solution and accordingly both are usually included in any guarantees offered by Advanced Damp Proofing. For instance if you were to carry out replastering only to a wall that continues to suffer from ingress of water (such as a wall without a damp proof course), the treatment is unlikely to prove successful in the long term. This is because renovating plasters are usually only capable of holding back moisture for a short period. Such a period would normally be during drying out of the wall after damp proof course has been installed. On the other hand of you were to install a dpc only in a wall that has damp and salt contaminated plaster on, it will not allow the wall plaster to dry out or for the salts in the plaster to diminish. Salts can absorb moisture and whilst your new damp-proof course is working well, these salts can readily absorb condensation from the air and your ‘damp’ stays and can probably look worse than before your ‘part treatment’. 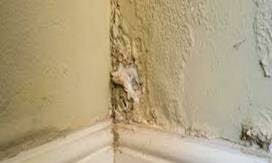 Therefore plaster removal and replacement must take place. All too often we visit properties where a dpc only has been installed and the wall plaster still tests and looks visibly damp.